Gérard de Nerval (French pronunciation: ​) (22 May 1808 – 26 January 1855) was the nom-de-plume of the French writer, poet, essayist and translator Gérard Labrunie, one of the Romantic French poets. His works are notable for his charming personality and intelligence, his poetic vision and precision of form. Two years after his birth in Paris, Nerval's mother died in Silesia while accompanying her husband, a military doctor and member of Napoleon's Grande Armée. He was brought up by his maternal great-uncle, Antoine Boucher, in the countryside of Valois at Mortefontaine. On the return of his father from war in 1814, Nerval was sent back to Paris. He frequently returned to the countryside of Valois during holidays, and he returned to it in imagination later in his Chansons et légendes du Valois. His prose translation of Goethe's Faust (1828) established his reputation. Goethe praised it and Hector Berlioz used sections of it in his legend-symphony La damnation de Faust. Nerval produced additional translations from Goethe and in the 1840s, his translations introduced Heinrich Heine's poems to readers of the Revue des deux mondes. During the 1820s at college he became lifelong friends with Théophile Gautier and later joined Alexandre Dumas, père, in the Petit Cénacle, a bohemian set affiliated with Charles Nodier, which evolved into the Club des Hashischins. Nerval's poetry is characterized by Romantic deism. His passion for the "spirit world" was matched by a negative view of the material one: "This life is a hovel and a place of ill-repute. I'm ashamed that God should see me here." Several of his works were influenced by his infatuation with an actress named Jenny Colon (1808–1842), of whom little is known. 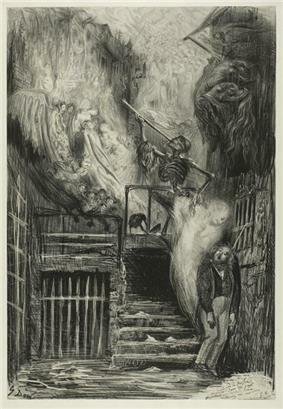 "La Rue de la Vieille Lanterne: The Suicide of Gérard de Nerval", by Gustave Doré, 1855. 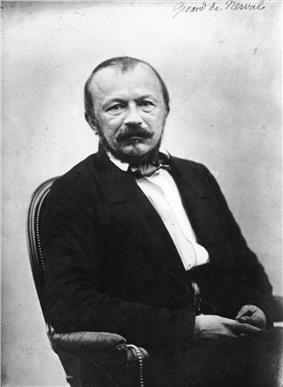 Gérard de Nerval's first nervous breakdown occurred in 1841. He published a collection of biographical sketches as Les Illuminés, ou les précurseurs du socialisme (1852). It included portraits of Rétif de la Bretonne, Alessandro Cagliostro, Quintus Aucler, and others. Increasingly poverty-stricken and disoriented, he committed suicide during the night of 26 January 1855, by hanging himself from a sewer grating in the Rue de la vieille-lanterne, a narrow lane in the fourth arrondissement of Paris. He left a brief note to his aunt: "Do not wait up for me this evening, for the night will be black and white." The poet Charles Baudelaire observed that Nerval had "delivered his soul in the darkest street that he could find." The discoverers of his body were puzzled by the fact that his hat was still on his head. The last pages of his manuscript for Aurélia ou la reve et la vie were found in a pocket of his coat. He was interred in the Père Lachaise Cemetery in Paris, at the expense of his friends Théophile Gautier and Arsène Houssaye, who published Aurélia as a book later that year. Lawrence Durrell used the phrase "his eyes reflect the malady of De Nerval" in his poem "Je suis un autre" (1942). Donald Swann set "El Desdichado" to music as "Je Suis le Ténébreux" and sang it in the Flanders and Swann revue At the Drop of a Hat (1956). This song appears on the live recording of that performance. Clive James, in his songwriting collaboration with Pete Atkin, wrote two lyrics that refer to the poem: "The Prince of Aquitaine" and "The Shadow and the Widower". Richard Wilbur's poem "A Prelude" in the collection Anterooms refers to Nerval. The poem mocks of the seriousness of Matthew Arnold's "Dover Beach". Wilbur writes: "And was upon the point of saying "Ah," / When he perceived, not far from the great Aiguille, / A lobster led on a leash beside the sea. / It was de Nerval, enjoying his vacances!" In the play "Cowboy Mouth" (1971) by Sam Shepard and Patti Smith, the character Cavale is obsessed with Nerval. He makes numerous references to him, claims that Nerval hanged himself on her birthday, and mentions Nerval's pet lobster. The title of the song Dream Gerrard, written by Vivian Stanshall and recorded by Steve Winwood, apparently refers to Nerval. 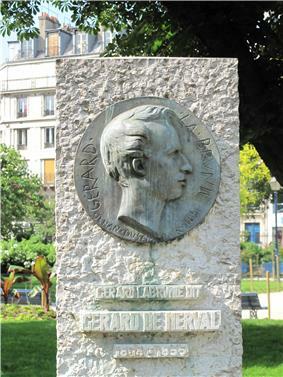 Nerval's poem El Disdichado was set to music for the album Feasting with Panthers, released in 2011 by Marc Almond and Michael Cashmore. It was edited, adapted and translated by Jeremy Reed. Les Faux Saulniers (The Salt Smugglers, 1850) — a sprawling work published over several weeks in the journal Le National. He later incorporated some of the same material in Les Filles du Feu (in Angelique) and in Les Illuminés (in L'Abbé de Bucquoy). Voyage en Orient (1851) — an account of the author's voyages to Germany, Switzerland and Vienna in 1839 and 1840, and to Egypt and Turkey in 1843. It includes several pieces he had already published elsewhere, including Les Amours de Vienne, which originally appeared in Revue de Paris in 1841. La Bohème Galante (1852) — dedicated and addressed to Arsène Houssaye, a collection of short prose works and poems including some of the Odelettes. Lorely, souvenirs d'Allemagne (1852) — an account of his travels along the Rhine, also in Holland and Belgium. It includes his play Léo Burckart, under the title "Scènes de la Vie Allemande". Petits Châteaux de Bohême (1853) — a collection of prose works and poetry, including the play Corilla which was subsequently included in Les Filles du Feu, and the poems of Odelettes, with some of the sonnets from Les Chimères. Les Filles du Feu (1854) — a volume of short stories or idylls that includes Sylvie. Les Chimères — a sequence of twelve sonnets appended to Les Filles du Feu. Pandora (1854) — another Fille du Feu, not finished in time for inclusion in that volume, written in the style of Sylvie and set in Vienna. Also known as La Pandora, it is often subtitled: Suite des Amours de Vienne. Aurélia ou le rêve et la vie (1855) — a full-length sequel to Les Filles du Feu. A fantasy-ridden interior autobiography that opens with the phrase: "The dream is a second life," which influenced the Surrealists. Published posthumously. Promenades et Souvenirs (1854-1855) — a collection of essays after the manner of Les Nuits d'Octobre, describing the Saint-Germain of the author's childhood and youth. It includes another Fille du Feu, Célénie, in the last essay ("Chantilly"). ^ The Rue de la vieille-lanterne no longer exists. ^ Miller, Henry, The Time of the Assassins, A Study of Rimbaud, New York 1962, p. vi and vii. DuBruck, Alfred (1974-1975). "Nerval and Dumas in Germany," Nineteenth-Century French Studies, Vol. III, No. 1/2, pp. 58–64. Gautier, Théophile (1900). "Gérard de Nerval." In: The Complete Works of Théophile Gautier, Vol. VIII. London: The Athenæum Press, pp. 96–116. Sowerby, Benn (1974). The Disinherited: The Life of Gérard de Nerval. New York: New York University Press.